Submitted by Alexander Briones on Sep. 1, 2018. First published on Jan. 13, 2016 by Jason Horton and most recently updated on Sep 1, 2018, by Alexander Briones. With their compact profile and volume control, electronic drums are ideal for beginners and students, even more so when considering the various sound options and built-in training features that can help liven up daily practice. Here, we look at entry-level market favorites based on the most current reviews and ratings, including those from 2018. In addition to being an instrument themselves, some of these entry level kits also work as MIDI controllers where you can get much more expressiveness and 'feel' by recording your drum tracks to MIDI rather than programming them directly into a DAW. If you're interested in more advanced options then please go to our other guide: The Best Electronic Drum Sets. 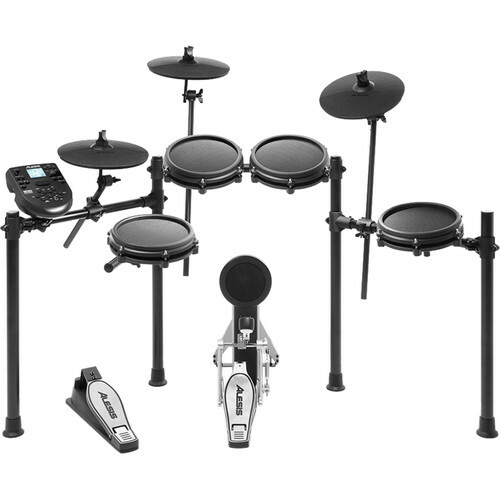 For the price, the Alesis Nitro Mesh Kit gives you quite a lot, with its 8-piece configuration. And it's not just about the number of pieces because it comes with specialized mesh pads, something that are usually priced much higher. The 8" dual-zone snare features mesh material that gives makes it feel closer to acoustic snare than regular rubber pads. The same material is also used on the kit's three 8" mesh toms. Completing the set are three 10" cymbals, a hi-hat pedal and kick pedal. All of these connect to the Alesis Nitro drum module which offers 40 drum kit sounds, 385 individual sounds, and 60 play along tracks right out of the box. Other features include built-in metronome, Aux input, USB and MIDI connectivity. Overall market sentiment is mostly positive, with many reviewers commending the Alesis Nitro Mesh kit for being a great starter set. Value for money also often comes up in reviews, impressing many budget strapped users with its mesh toms and snare. Another common talking point in reviews is its ease of use, making it great even for those with zero drumming experience. There are a few reports of cables failing, and other build quality issues, but these are issues that can be avoided with proper handling and careful setup. Don't let budget constraints stop you from learning to play the drums, check out the Alesis Nitro Mesh kit. 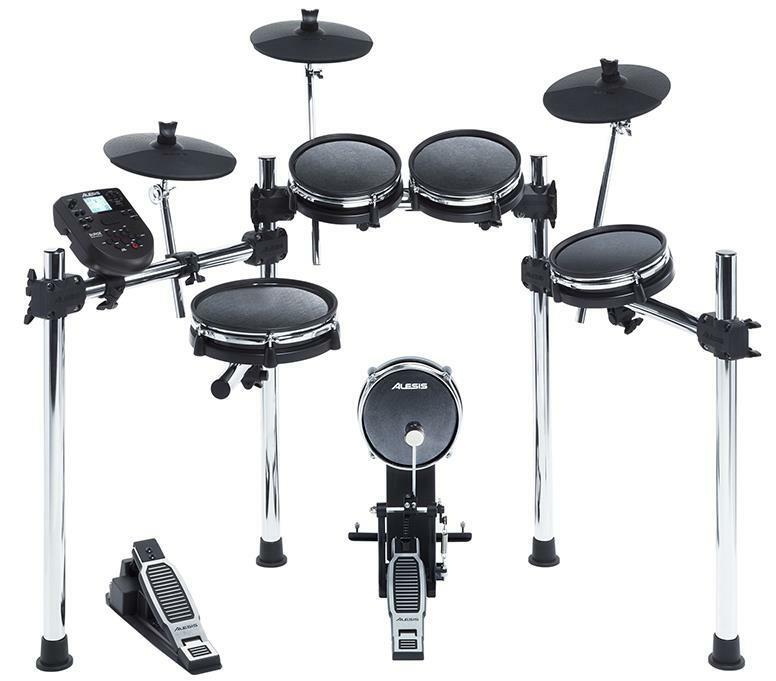 The Alesis Surge Mesh Kit is a complete drum kit with 5 drum pads, 3 cymbal pads, drum stand and accessories, including both the kick and hi-hat pedals, and drum sticks! What's even better is that the drum pads have two zones, and you can tighten or loosen the mesh to your preference - and it does all these while retaining an entry level price point. As for the drum module, it comes with 385 different drum and percussion sounds, along with 24 different kit sounds. Other features include 60 play-along practice tracks, MIDI connection via USB, and an Aux input for playing along with your favorite tracks. Many of the positive comments that this kit gets are from drummers who are happy with its playability. They appreciate the quality of the mesh pads, and how it responds to nuances in their playing. The quality and usefulness of many of its drum sounds also got a lot of thumbs up, even from experienced drummers. Overall build quality and value for money also comes up quite often when people talk about the Alesis Surge Mesh Kit. There are a some users who are not too happy with some of the kit's limitations, specifically with the hi-hat which only provides an open or closed sound with no semi-open sound, but this is to be expected given the price point. There are also a few reports of volume balancing issues between various sounds. All in all, the Alesis Surge Mesh Kit is a great buy for what it can do, a great first, even second drum kit for those with budget and noise limitations. The Roland TD-1K is a compact kit well suited to younger players and those who don't have a lot of spare space at home. The cymbals can be choked just like acoustic cymbals, and the hi-hat plays much more like a real one. The cymbals are also dual zone and their velocity sensitivity lets you get a 'bell' sound as well. It also has a built-in metronome and coach functions which measure your performance and give you feedback helping you to improve your drumming. It's a small compact kit which is a plus if space is at a premium, but if you're used to playing a full sized kit you will have to adjust to the size. The demo video below gives you a good sense of the size and layout. Reviewers consistently praise the sound of the 15 preset kits and the realism of the hi-hat. Many reviewers also say that with the USB MIDI it works very well as a MIDI controller and for recording drums to MIDI. In his expert review on Harmony Central Dendy Jarrett said, "Even though the TD-1K is marketed as an entry- level electronic kit, I would consider it for light-playing gigs". The main issue with the Roland TD-1K 5 is for those who want a dual zone snare which it doesn't have. This is a great choice for smaller drummers or if you don't have a lot of spare space. 81 out of 100. Incorporating 20+ ratings and reviews. The most standout feature of the Simmons SD550 Mesh is its "tension-able" mesh heads that are designed to better replicate the bounce and feel of acoustic drums. This includes the 10" dual zone and dual-ply mesh snare, along with the 8" dual-ply mesh toms. It also comes with a 10" hi-hat with pedal, kickpad with built-in kick pedal, a 12" ride cymbal, and a 10" crash cymbal with choke feature. All of these are used to trigger the SD550 drum module, which comes with 50 drum kits, 352 different drum sounds, 60 songs, 2 Demo Songs, VAR (Variable Attack Response) technology, 50 custom drum patterns and more. Reviewers have mostly good things to say about the Simmons SD550 Mesh, and most of these good reviews are centered around the feel and playability of the mesh pads. Another commended trait of the SD550 Mesh is its intuitive drum module, which even instructors have commended as very easy to use yet versatile. There are a few who are concerned about the proprietary wiring cable on this kit, some recommend careful handling, especially when breaking down or setting up the kit. Some experienced drummers are not happy with some of the sound options, but this is to be expected, given the price and the many different musical preferences that we all have. Drum Sticks: these come in different weights with 5A being the most popular - you can get these at Sweetwater. Drum Throne: This is what a drummer's stool is called - they are much better than regular chairs and you can find the highest rated ones in our Drum Throne Guide. Headphones or Amplifier: Most electronic drum kits don't provide sound on their own, instead you have to plug your drum's brain or sound module into headphones or an amplifier. To practice quietly (and not annoy the neighbors) get yourself a set of closed-back headphones - see our guide here. If you're going to play with other musicians, or if you just want to be loud, then you'll need an amplifier. There are a range of different amps that are good for drums - see our guide to Drum Amps and for further information read Things To Consider When Buying An Amplifier For Electronic Drums. If you want to use it as a MIDI controller or to record drums directly your computer then you'll need one that sends out MIDI, which in this price range will usually be MIDI over USB. Drum pads with multiple zones are ones which you can hit in different areas to trigger different sounds. Zones are usually concentric circles. For example a snare pad with multiple zones allows you to play regular snare sounds as well as selecting a rim-shot sound for the outer circle. The more zones you can get the wider the sound pallet is that you can work with in a single pre-set or custom kit saved in your sound module. Some electronic kits come with cymbals you can choke - this means that after you strike them you can grab them with your hand and the cymbal sound will immediately stop just like with an acoustic kit. Some of the cheaper models don't have this option so read the details carefully if this is something you want. We looked at all electronic drum sets currently selling at major American online music gear retailers for less than $500. We then gathered the the most relevant and current feedback about them, which tallied to over 2,800 sources, this includes reviews, ratings, forum posts, and other user and expert feedback. All these data were then processed via the Gearank Algorithm to produce the scores out of 100 you see above and added them to our Music Gear Database. We then selected the highest rated options to present above. For more information about this process please read How Gearank Works. You can see all of the electronic drums we have processed for Gearank here - if you feel there is a beginner kit that we've failed to consider then please say so in the comments bellow and we'll take a look at it - if it scores high enough we'll add it to this guide. Submitted by DC (not verified) on Nov. 8, 2016. The behringrer XD80usb cymbals do choke. It takes a specific touch, but they do. Submitted by Jason Horton on Nov. 11, 2016. Submitted by Maruel (not verified) on Jan. 7, 2017. What about the Millenium budget kits sold by Thomann? They have a $300 one (MPS-150) that reviewers constantly praise on their website. Then there is the MPS-425 on the same price range as the Roland TD-1K but with a mesh snare and also excellent reviews. I would love to know how good these Millenium ones really are as I want to get a budget kit to learn drums that I won't outgrow anytime soon, but I don't want to risk spending $500 if I can spend $300 because I don't know how good I am going to be. Submitted by Jason Horton on Jan. 8, 2017. We are currently focused on music gear that is sold by the major American retailers so we don't have any data on Millenium kits at the moment. Submitted by Nippun Sharma (not verified) on Apr. 19, 2017. I am buying my first electric drum kit and I wanted to know that along the drum kit is anything else required for example an amplifier. If your drum set doesn't include one, you'll need a Drum Throne (Amazon affiliate link) to sit on while playing. To hear your drums you'll either need a set of Headphones or an Amplifier. The main options chosen by electronic drummers are Drum Amps, Keyboard Amps or a Powered PA Speaker. If you're not sure which would be best for you then read Things To Consider When Buying An Amplifier For Electronic Drums. Lastly, it's always a good idea to have a couple of spare sets of Drum Sticks (Amazon affiliate link) sitting around just in case. Submitted by Bale (not verified) on Apr. 22, 2017. Hey, am buying a new kit as beginner..i would like your professional opinion on Alesis Forge Kit as it is also priced $500 same as the Roland TD1K. 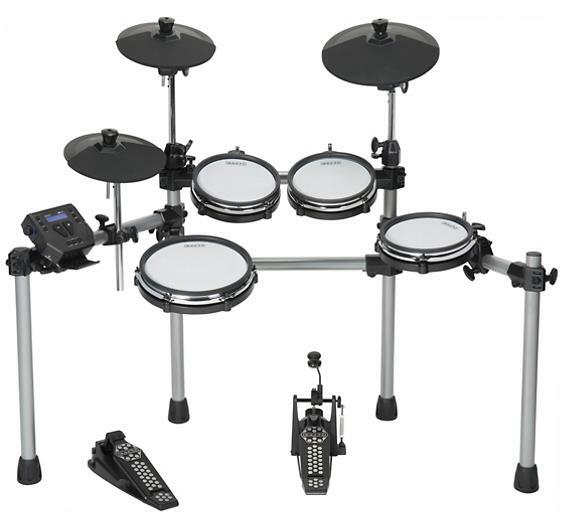 I noticed that the Alesis Forge kit is overall bigger sized compared to the Roland which in my personal opinion look like a toy..would the size of the electronic drum kit affect my ability to learn acoustic drum in the future? Submitted by Jason Horton on Apr. 25, 2017. You will always have slight adjustments changing between kits including changing between acoustic kits. The size of the kit won't have much effect on learning acoustic drums later - the main thing is that your electronic kit has 5-pieces + hi-hats and at least 1 cymbal - 2 cymbals are better. The Alesis Forge kit is fairly well rated - you can see its Gearank score here. Submitted by Anonymous (not verified) on Jul. 1, 2017. Hey I was wondering if having multiple zones on drum pads makes it more difficult to learn. Submitted by Jason Horton on Jul. 1, 2017. I personally don't think so - at least not by much. The small amount of additional accuracy required when hitting the pads is relatively minor compared to learning to get your right arm and leg to work independently in order to play mildly syncopated hi-hat and kick patterns - at least that was my experience. For someone who's just beginning to learn drums, I don't think it matters too much if they get a single zone snare meaning they won't be able to play rim shots - the same goes for single trigger cymbals that don't allow you to strike the bell. If you start with a basic kit now and your proficiency later increases to the point where you want to use more advanced techniques, then you can always either upgrade your pads/triggers or move up to more advanced kits like these. Submitted by Ronald (not verified) on Aug. 10, 2017. Hi, was wondering, what is the best value for absolute beginners but I'm thinking to use it for long term also, so maybe not the very basic ones (im thinking Forge kit, if I can find a good deal or even 2nd hand). Another thing, I live in a flat in Spain, and the wall is kinda thin, so I'd like to know how loud is the edrum? Last, (nippun already ask this but i just wanted to confirm), to start playing the edrum, I just need to buy the stick & the stool? Submitted by Jason Horton on Aug. 10, 2017. The Alesis Forge Kit does sound like the right choice for you - although they might be difficult to find second hand - plenty of people are selling old Alesis DM kits but I haven't seen many Forge Kits second hand yet. The rubber heads on the snare and tom pads of the Forge basically have the volume equivalent to hitting a thick piece of rubber with a drum stick - so not very loud. The only extras you'll need, other than the obvious drum sticks, are a set of headphones so you can hear your drums and backing tracks without annoying your neighbors, and a drum throne to sit on. Submitted by Ronald (not verified) on Aug. 11, 2017. Noisewise, at least now I know I cant play the drums at night, but lets see how noisy it is when I've bought it! Btw, 1 question, in terms of quality, which 1 better, Medeli or Fame, as I saw plenty of 2nd hand with good price in Europe. And I'm sure wont need amplifier & I have studio headphones already. Submitted by Jason Horton on Aug. 11, 2017. We haven't analyzed either Medeli or Fame electronic drum kits yet, not because we know of anything wrong with them, but because they haven't had widespread availability in the USA when we've been doing detailed research on electronic drums. I like what I see with fame, and with €350 I can get brand new DD5500 pro (I think mid level), now im just browsing for good deals, or 2nd hand, and reviews on youtube. Submitted by Jodi (not verified) on Aug. 22, 2017. Hi, is the roland kits upgradeable? would like to have a multiple zone snare & toms pads on it as space is pretty much an issue in my apartment..
Roland have a more advanced version for $100 more that has the features you want with multiple trigger snare and toms - check out the Roland TD-1KV. Submitted by Javier (not verified) on Dec. 31, 2017. Thanx for the guide. I really like the Roland TD-1K, the chokable cymbals, the sound ... Finally I went for the Yamaha, since I am a beginner and the fact that you have to pay almost 200$ for a kickpad in the Roland. The technique of the kick is missing otherwise. The Yamaha has surprised me in its integration with iphone. You can create your own kits, the training mode is amazing, can import midi songs as backingtracks. What I like most is to control garageband's drum kits and recordit. No computer, no usb interface, just the camera kit adaptor! Submitted by Subash (not verified) on Feb. 3, 2018. Submitted by electronic guy (not verified) on Sep. 15, 2018. Submitted by Jason Horton on Sep. 16, 2018. Thank you for the compliment - don't forget to tell your friends about Gearank! Any good for a kid learning? Submitted by Nic (not verified) on Dec. 17, 2018. Any good for a kid learning? Table-top Electronic Drum Foldable Rubber-coated Water-resistant Pedals Sticks for $110.10. Table top electronic drum pads can be a lot of fun to play with but they don't do much to help in terms of learning how to play a drum kit. In particular they don't teach you how to use your feet on the hi-hats or kick drum. If the kid is receiving instruction then they can use a table top set to practice basic stick control with actual drum sounds which you don't get with practice pads. The bottom line is that they're more fun than practice pads but you can't learn important drum kit techniques using them. Submitted by Nic (not verified) on Dec. 18, 2018. Great that answers addresses my concerns. My son will be starting drum lessons of sorts next year at school. I believe it's many different forms of percussion i.e. bongos etc and it's only for one term unless he really takes to it and I'll look at investing further. The table top will as you say will assist him with grasping the basics and I'm hoping they take head phone so that he can play as much as he wants without driving me nuts. My daughter want to play piano so I'll grab her a keyboard. She's 5 so between the two of them it'll be full noise. Which I am 100% behind and I play guitar and a bit of drums but there are limits.. haha! Thanks a lot. Submitted by Julian (not verified) on Apr. 16, 2019.
thank you for your insightful post! I was wondering if there was any specific reason you hadn't mentioned Drum from OWOW? It does seem like an interesting concept, what are your thoughts? Submitted by Jason Horton on Apr. 16, 2019. 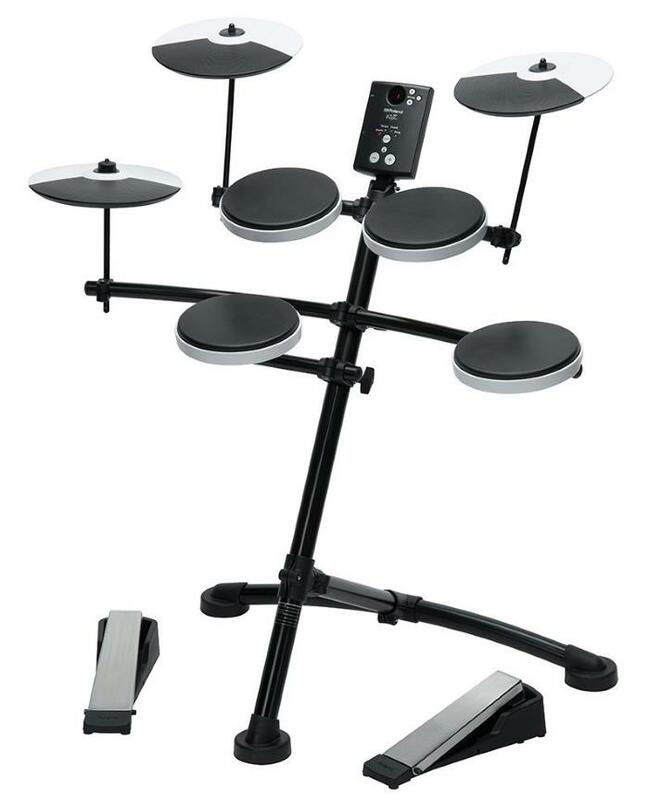 Although it looks like it might be fun to play with, it's a MIDI controller for playing 'air drums' which doesn't meet the definition of an electronic drum set so it's not eligible to be considered for this guide.